I visited Mike and Joannie for a week and a half in early March. During my visit, I experienced their new Toyota Prius hybrid firsthand. There are a number of hybrids on the market, but Toyota has sold more than all other automakers combined. The Prius engine consists of two systems, one a gas engine and the other an electric motor. The electric motor operates when engine demand is low, usually at low speeds. 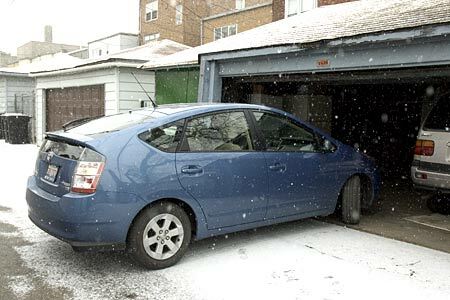 Coming out of the garage, the car was dead silent, as if Yoda were pulling it out with a wave of his hand. At higher speeds, the gas engine powers the car and also recharges the batteries. When you pump the gas hard for greater acceleration, the gas engine and electric motor work together for added kick. 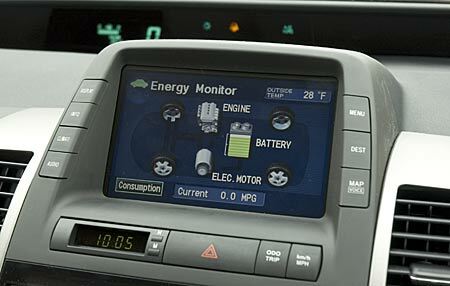 I know much of this because the display screen on the center of the Prius dashboard displays a schematic indicating which system is in play while you're driving (everytime you turn the car on, you have to click to agree to a waiver form that frees Toyota of liability if you crash while driving because you were engrossed by the graphics on the display). This schematic also indicates your current fuel consumption/gas mileage. The geek in me couldn't stop trying to boost my gas mileage. The first time I drove the Prius to pick up Mike and Joannie from work, I played around with the car to see how I could achieve optimum gas mileage. The goal was to achieve something over 50mpg. I never reached that figure. Their Prius is new, and the cold weather in Chicago didn't help. However, I did become skilled at emphasizing use of the electric motor over the gas engine in order to maximize gas mileage. The optimal driving method for minimizing gas consumption in a hybrid is not unlike that with a traditional internal combustion engine. Accelerate, coast to a stop, repeat. Obviously, you can't drive like that on city streets, so what I did was accelerate to a crusing speed, then coast until the gas engine turned off, then used the electric motor to maintain velocity. It takes a gentle foot, and with a longer drive and less stop and go, I think I could have achieved 50mpg. Regardless, driving was fun again, and next time I'm in Chicago I'm shooting for 60mpg. Other fun things about the car--instead of inserting a key to turn on the engine, you simply need to have the car key on you when you depress a starter button. Like powering on a stereo. Mike and Joannie's Prius came with select voice-activated commands. Hit a button on the steering wheel, and the car will mute the radio and listen for a voice command. I did not have the glossary of all the commands, and like any typical male, I skipped the instruction book and instead barked random instructions as I drove. "Track...up," the serene female computer voice responded. "Disc 5," the Prius computer cooed. Bingo. Like any newlywed couples, we merely needed some time to work out our communications issues. 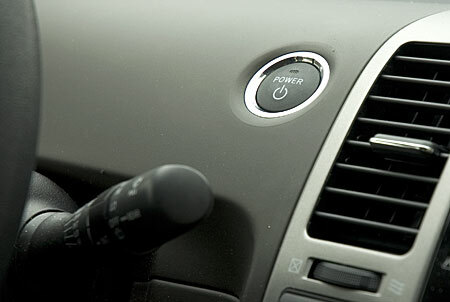 I hope the Toyota engineers insert some Easter egg voice commands in the next gen Prius, or offer different computer voices to choose from. On a long nighttime road trip, who wouldn't appreciate some Michael Knight/K.I.T.T.-like conversation with their automobile? And, upon failing to successfully merge into traffic from an on-ramp, what driver couldn't use a tongue-lashing/motivation speech from Alec Baldwin? "But the engine is too weak?" you'd protest. "The engine is weak? The effin' engine is weak?! YOU'RE WEAK," Alec Baldwin would respond. "I've been driving since I was twelve..."